History is being rewritten to fit the New World Odor. Thread: History is being rewritten to fit the New World Odor. Here is why. I can prove they probably faked the Assange photos with a simple image search of the Gettysburg Address. GET A LOAD OF THIS: They back wiped all the digital copies of photos, probably even via windows updates for those who had them, and the Gettysburg Address now, even in the photos, says FATHERS, not forefathers. Yet the AI missed references to the Gettysburg address in Johnny Cash tunes, computer programming forums, and English structure web sites. It purged only the places that claimed to record history and forgot music, other forms of education, and off topic blogs that happened to reference it. The AI actually over wrote ALL PHOTO REFERENCES and re-arranged the text in all photos perfectly. If this happened, software can do anything now, and can do it in bulk, automatically. See this. No matter how the photo appears or what font it is in, it has been perfectly corrected to replace "forefathers" with "fathers". Yet this Johnny Cash tune still has forefathers, and you can "take it to the bank" that Johnny Cash did not screw this up. The proper reference he provided was overlooked because music was not in the genre the AI was set to hunt out.It has become obvious that what is happening now is that revisionists, who want to destroy history, have started using massively powerful artificial intelligence to back write everything digital, including even photos and locations of historic reference, provided they are in digital form. There is probably no "Mandela effect" per se, instead there likely are revisionists using advanced AI to back write everything and erase reality from the internet. This time they screwed up and only re-wrote direct historic reference that claimed to be historic reference and missed music. I'll believe Johnny Cash long before I'll trust a Google linked history site (or any site or photo any search engine pulls up nowadays.) We are obviously in the middle of a war, and the tech left is doing all it can to erase who we are in this war. Due to the fact that the fakes of all the documents and photos of the Gettysburg address are totally convincing, no matter what font, paper, material, camera angle - you name it - I am going to call it like I suspected all along. Assange is yet another one of these fakes, if the AI could fake all those photos so well, in addition to finding them, hacking the computer they were on and replacing them with something that looks perfect, there's no reason at all to believe we got the truth with Assange over the past couple days. Pamela is faking a love affair after bringing him "lunch" in 2016, the base reality of it all is now written in the Gettysburg Address, PERIOD. Re: History is being rewritten to fit the New World Odor. 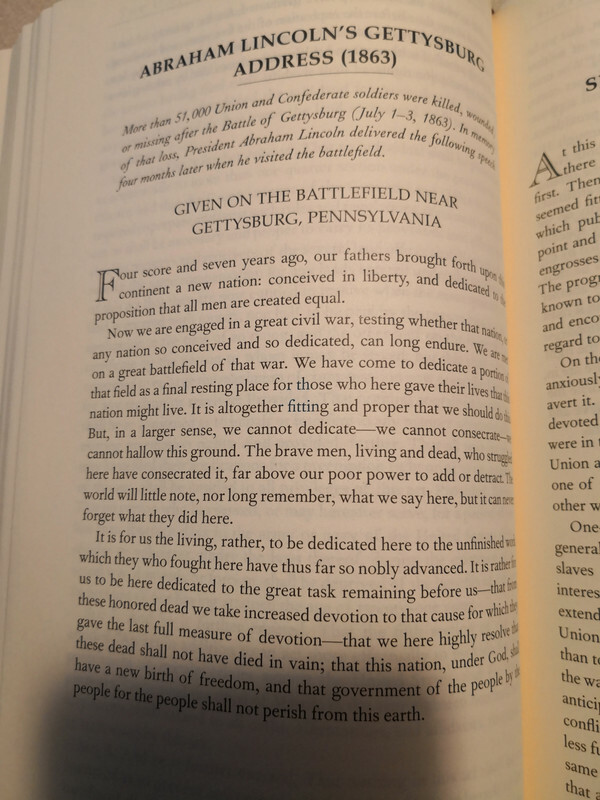 I'm still trying to figure out how they got in and changed 'forefathers' to 'fathers' in the Gettysburg Address in my 1950 Funk and Wagnall Encyclopedia. Must have done it while I was asleep. If you're foolish enough to believe that old 1950 stuff, you have just become a volunteer to our new US Citizen training camp, where you will learn the proper way to think. 1st .... I have to believe there are books from the 1870s written that include the text. Have you found them? 2nd ... I don't know that the words spoken or written anytime during or after a manufactured 'civil' war have any meaning today. 3rd ... A well known fact is the alcohol of the period prior to and after the civil war was adulterated with harmful chemicals that prevented clear and critical thinking. 4th .... I don't see where advocating 'fathers' advances anyone over the use of 'forefathers'. 5th ... Do you see this issue as one you are willing to go to battle for? What is this small voice crying from the wilderness. We will do what we always do, ignore it. their influence on the affairs of men, they are essential or non-essential. law, see 12 East, R. 38; 2 Jac. & Walk. 263; 5 Taunt. R. 143; 3 B. & Cresw. Mass. R. 342; 7 Mass. R. 452; 7 Mass. R. 488; 9 Pick. R. 112; 1 Binn. R. 27. Vern. 243; 1 John. Ch. R. 512; 2 John. Ch. R. 51; 1 Pet. S. C. R. 1; 6 John. Ch. R. 169, 170; 8 Wheat. R. 174; 2 Mason, R. 244, 342. Lois Rom. mot Fait; Dig. 22, 6, 7.
is therefore voluntary ignorance. Doct. & St. 1, 46; Plowd. 343.
the sale void. Poth. Vente, n. 3 and 4; 2 Kent, Com. 367.
this fact would not be essential, and the marriage would therefore be good. Vide, generally, Ed. Inj. 7; 1 Johns. h. R. 512; 2 Johns. Ch. R. 41; S. C.
M. & S. 378; 12 East, R. 38; 1 Vern. 243; 3 P. Wms. 127, n.; 1 Bro. C. C.
92; 10 Ves. 406; 2 Madd. R. 163; 1 V. & B. 80; 2 Atk. 112, 591; 3 P. Wms. 315; Mos. 364; Doct. & Stud. Dial. 1, c. 26, p. 92; Id. Dial. 2, ch. 46, p.
v; 8 Wheat. R. 174; S. C. 1 Pet. S. C. R. 1; 1 Chan. Cas. 84; 1 Story, Eq. Merl. Repert. h.t. ; 3 Sav. Dr. Rom. Appendice viii., pp. 337 to 444. Ignorance is either voluntary or involuntary. You might believe you ignore something but the fact is I am not addressing you. Your subconscious is the entity that performs the hard work. You are just along for the ride. Spoken like a card carrying US Citizen. Have you heard voices speaking? Have you articulated an injury upon which relief may be granted? No? Case dismissed!! !